Law firm and attorney marketing strategies help build your practice and online reputation. The right law firm marketing ideas can help you book more clients so you use all of your billable hours in a day. Legal marketing combines the benefits of both digital and traditional marketing to create the right mix to reach customers. Law firms and attorneys face fluctuations to client needs. Some clients might be one-time clients while they work through an event, such as a divorce or will preparation, while others are ongoing, such as businesses. Because of these fluctuations, law firms and attorneys should have a marketing and SEO strategy to bring in new clients consistently. There are some critical aspects to bringing in new clients, including the following. Ready to take the next step in securing more clients for your law firm? Read on for your complete guide. Booking more clients means you use all of your billable hours in a day. Attorneys who miss out on work during billable hours, ultimately make less money in a year than those who keep their schedules booked. But because clients can come and go according to needs, you need to continually be generating new leads to get people through the door. In the digital marketing era we now live in, that means being present on the platforms you need to online to be discoverable and beat out your competition. There are two types of marketing techniques at play now, and those are inbound and outbound. Inbound marketing is the philosophy of bringing customers to you through outstanding and engaging content. For the most part, inbound marketing is earned and not bought. On the flip side, outbound is marketing where you push out information and details to your potential customers through traditional marketing channels, like radio or TV ads. A strong marketing mix for law firms blends both inbound and outbound marketing tactics to build interest and new client leads. As you build out your marketing strategy, here are the places you’ll want to be and channels you should be employing to win at generating and booking more client leads. Additionally, the majority of purchasing decisions are made online now, which means that you need to appear alongside your competitors with ratings, past client testimonials and reviews, and business information when potential customers are searching for your business. Here are the steps you should take to show up at the top of local search results. Google My Business strategies to help your law firm marketing. Your business might already be listed on Google. If it is, you'll need to go in and claim it. As part of the process, you'll have the opportunity to update any incorrect contact information. Once claimed, you'll also be able to keep your contact information up to date on an ongoing basis. If your company is not yet listed, you can create a Google account or sign into an existing one and set up the listing. You’ll be asked how you want to verify your company, and can select from a suite of options, including by a postcard in the mail sent to your business address. Inconsistencies of your business information anywhere on the web will cause Google to be suspicious of your content. You want to ensure everywhere your address is listed that it matches perfectly so that search engines can tell that all references go back to your one company. You should pay attention to your social media profiles, Yelp and association websites, such as Super Lawyers, your website, and anywhere else your address is listed. Online reviews serve as a sort of digital referral, often between people who have never met. Additionally, search engines tend to favor companies with reviews when choosing which company to display at the top of local search results. As a lawyer, this can be difficult because people might be hesitant to share their experience and publicly divulge details about their private relationship with you. To help with this, you might try providing a sample framework of a review for a client that shows how to keep details vague. This framework might make them more comfortable sharing. Additionally, you can make your solicitations more subtle, like putting them in your email signature. No matter how you choose to ask for reviews, realize that your industry is different than others and you might only get a review here and there. Getting listed on online boards and listings for local attorneys will also help your rankings, especially if it includes a link to your site. The more quality links from other websites that direct to your website, the better. There is a key in that sentence though that we want to make sure you didn’t miss: quality. Having just any website linking to you is not all that beneficial. You should ensure that the website is reputable. The chamber of commerce for your area is also a great place to earn a listing. You might have to pay a small annual fee to join the chamber, but those links to your website are highly regarded for the most part. Finally, consider getting involved in your community. Sitting on a board of directors, volunteering at a local event or sponsoring a 5K could mean good link backs to your website and mentions of you online. This will continue to bolster your local search ranking. Investing time in your site after the initial set up is complete can be a challenge. Setting aside the time and effort when there's so much to do and hours to bill doesn't feel like a top priority. But getting your SEO in the best shape, it can yield great results. Display your address prominently on your site so that all those other listings throughout the web are very evident that they lead back to you. Additionally, writing blog posts about local cases and law changes in your area can help you show your expertise and improve your local search ranking. Social media is a great place to show the more human side of your practice. People tend to have preconceived ideas about attorneys and might view them as stuffy. You can show a little bit more of who you on social media. Your social media presence should still be professional, but this is a great place to discuss your community involvement, showcase your awards and more. Each platform of social media has different strengths. Here is how to use a few of the most popular platforms. Instagram is the visual social media platform. It was designed to highlight stunning photography, which means you can use it to capture readers. You can use a program like Canva to showcase your reviews so that others can learn more about what makes your law firm so great. You can also offer tips, such as questions to ask your attorney during a consultation. Or, top 3 reasons to use an attorney for your business formation. These are great visuals that will highlight important aspects of your practice while informing potential clients. Additionally, Instagram can house short videos, such as explainers or overviews. Videos add a nice touch to your profile when people are quickly scrolling because it can cause them to stop and look. 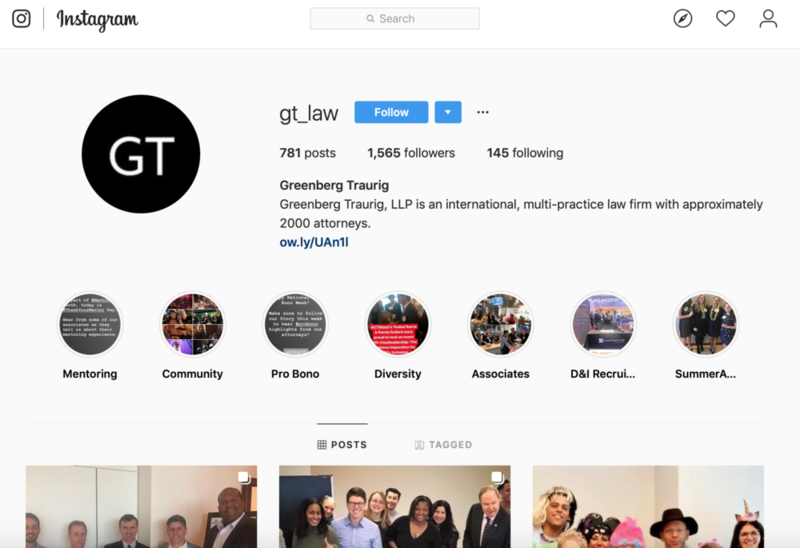 One law firm account that offers a great mix of content is Greenberg Traurig (@gt_law). The page shares a variety of content from community involvement to activities from the summer interns. You’ll also find out where the attorneys are with conference appearances and speaking engagements. The law firm gets in on national holidays, such as national women's day to show their support for groups and organizations. You'll see the more fun side of office life with fun Christmas party outfits and fun get-togethers. This way, you can get to know a bit more of the office character. Facebook law firm marketing ideas. Facebook is excellent for interaction. You also don't want to overlook Facebook as part of your local search strategy because it provides another place for you to list your company name alongside your address to give it further credibility. Another area Facebook is strong with is clickable links. Instagram lacks this, but Facebook allows you to post articles and share details with your audience for them to read right there on the platform. Don’t just launch a Facebook page without a strategy though. You want to be sure there is regular content out there when people visit your page so that it’s obvious you’re still in business. The Sam Bernstein Law Firm has just shy of 35,000 page likes on Facebook. The team regularly posts on Facebook to keep their content fresh, and you'll see a variety of content types from videos to infographics. Additionally, the firm shares its blog posts and helpful information for clients and prospective clients to learn more about their services and legal news in Michigan where the firm does business. Snapchat has a large fan base of 150 million users. Snapchat ads can help you build greater awareness for your law firm, especially with a younger audience. Furthermore, if you're sponsoring a local event, you can create a custom Snapchat filter to provide visitors with a fun way to interact with your brand. The visitors of the event will appreciate being able to use the filter and will associate your firm as being a community supporter. LEgal marketing on pinterest can help earn new readers and clients. Pinterest is a great way to get your blog articles out there as well as any short tips and tricks graphics you created for Instagram. Pinterest is centered around posting images that can be pinned to boards that follow a particular topic or category. This enables users to go back and reference the materials quickly. Because links on Pinterest are clickable, this is an excellent opportunity to share your expertise and lend your voice to the legal discussion online. Trolman, Glaser & Lichtman, P.C.is a law firm that executes on Pinterest well. The firm has different boards for its various practice areas and shares news and information related to those practice areas to showcase its expertise. You'll find fun imagery and interesting headlines that draw you in to read their content. The firm is based out of New York City, and so it has content in both English and Spanish to serve its audience. While reputation management doesn't have a considerable bearing on your local search ranking, it does affect how the public views you. You should be monitoring what people are saying about you online and responding accordingly. One of the great things about claiming your Google My Business listing is that you can set alerts for mentions of your firm more efficiently and respond promptly. Plus, before claiming your listing, you can't respond as your company, so it's important that you claim it. Negative reviews can hurt your online reputation but ignoring them can do even more damage. Although a response to your review doesn't necessarily make it go away, it shows that your firm cares and will do the right thing to ensure clients are satisfied. There may be times when someone posts a fraudulent review of your business, in which case you can have it flagged as not pertaining to you. Google has a process for removing such posts and so does Facebook if you have turned on the review function on your business page. There are guidelines for what you can remove from your review listing, including false negative reviews, reviews including profanities, and reviews targeted at hurting your law firm. When a negative review falls outside these guidelines, it's best to respond with an honest response. Apologize and try not to be defensive in your response. The response from the law firm makes it clear that they are doing what they can to make it right. In their message, the firm makes it clear that they are doing what they can to reach the upset customer and handle the situation with the utmost care and respect. That makes for a good reputation management strategy. On positive reviews, the law firm’s reputation management team takes the time to say thank you. They make it clear that they appreciate the kind words and the time the customer took to write the review, which is also a good practice to have. Print still has its place in advertising even with the rise in digital. Your marketing plan should include strategic print ads that meet people where they are at. You'll want to pay attention to making it easy to get in contact with you. Print works well hand-in-hand with a digital strategy. So create short and easy to type URLs, offer the opportunity to schedule an obligation-free consultation online, or email your team with questions. More than likely, potential customers won't be ready to call you up after seeing a print ad so be sure you're making things as easy as possible. Postcards are an easy way to reach potential customers directly. Blanketing a specific area with postcards can get pricey though so try and be more strategic than that. Maybe it's someone you met at a networking event or subscribers to your email newsletter. No matter how you decide to use postcards, be sure that they are engaging visually. One of the most significant benefits of postcards is that you don't have to open an envelope to read the message. This means you can earn the reader's attention quickly with a strong headline and nice photo. Mailers give you the opportunity to provide content in a neat format, such as a booklet. Because this tactic is even more expensive than postcards, consider using these sparingly. Perhaps you send out a mailer with more information to leads who schedule a consultation with you. Include a personal note explaining how you appreciated their time and thought they would like to learn more about your firm. You can also use mailers to re-engage with clients you haven’t heard from in a while. The content in your mailers for customers you’re trying to win back might be different than what you send for prospecting so be sure to think about your audience before addressing the envelope or printing the label. Fliers are a great print piece to use for local events. If you sponsor a local event, you can often place print materials in the goodie bags they hand out or have a presence with a booth. Fliers can relate directly to the content and audience of an event because they're pretty simple to put together. You still want to have good visuals and content that hooks the reader so that they are interested in learning more about you because your flier will be among many other business fliers. Depending on the sponsorship, you also might have your flier right alongside your competitors. Most often, fliers are a full 8.5 by 11 sheets of paper, meaning you have plenty of room to design a stunning piece of content. Don't get carried away though just because you have space. Still, try to keep your copy short and sweet and use bullet points to break up the copy. Ads in a newspaper are hyperlocal. They let you get very focused on the specific community since they cover certain areas and you can pick which section to place your ad. For example, the business section might make the most sense for law firms as they look to reach small business owners and corporate executives. Most newspaper ads are black and white, which means graphics need to be simple. Your headlines should be bold and attention-grabbing without being cheesy or sensationalistic. Be sure to highlight how you are a local firm in the area to try and bring people in and show your appreciation for the local community. TV advertising allows you to show your legal practice instead of just telling all about it. Because of this, television is still a great way to get the word out about your law firm. Showing your attorneys on film is a great way to make them feel more personable and approachable. Here are the top 3 best TV commercials for law firms. Personal injury doesn't have the best reputation. Some call personal injury attorneys "ambulance chasers" because some are so aggressive in their approach. The reality is, personal injury attorneys play an essential role for individuals dealing with changes to their life through no fault of their own. This ad from Harris Personal Injury Lawyers focuses less on the attorney “talking head” videos you often see on this topic and more on a personal story. It covers one woman’s journey through a personal injury and how it affected her ability to do what she loves. The scenes show her attorney fighting for her through the process. To keep lawyers relatable, a lighter TV commercial can aid in showing another side of them. Pete Reid Law had some fun with their commercial. It shows various settings where the attorney steps in to help out such as picking up money that fell out of woman’s purse and giving it to her, scoring the winning goal in soccer and rescuing a drowning man in a pool. Once the commercial has your attention, it closes with a brief legal scene where the attorney says, "I rest my case." It then transitions to information about the practice. Customer reviews make this ad come to life. Instead of just listing off all the reasons you believe your law firm is the best, allow your customers to do the talking. This also allows you to use those reviews that you’ve worked hard to get and to manage. Showing the customers and hearing why they enjoyed working with the law firm makes viewers believe they could benefit the same way. Your website is your online persona. It’s the first impression you give to people you’ve never met and may never meet depending on how that first impression goes. Because of this, it’s crucial that you give your website the time and attention it deserves. If you stood up a simple WordPress site 10 years ago and haven’t touched it since, it’s time to go back and review it as if you were a customer. To get you thinking about how to plan for a great website, here’s a look at three well-executed ones. Quinn Emanuel is a firm of more than 800 attorneys. As far as law firms go, that’s pretty massive, so you might not have the resources to execute a website quite so involved, but there are aspects that you can pull from it. The homepage tells a story of what you need to know about the firm to choose them as your litigation attorneys. They start with a bold heading from “The Wall Street Journal” that quotes them as “a global force in business litigation.” Then. As you scroll, you can search for information on a specific attorney, read their latest news and see at a glance why they are a top litigation firm by the numbers. Your website should be a part of your law firm marketing strategy. 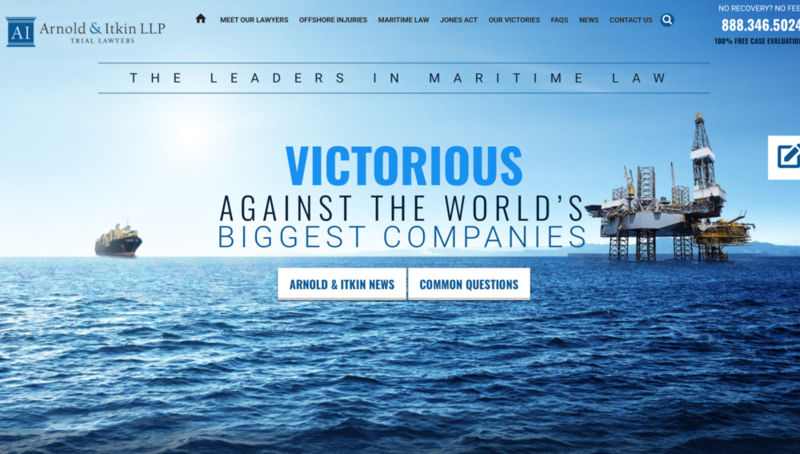 Arnold & Itkin LLP is a niche law firm focused on maritime law. Despite being a niche, their website is quite impressive. The water in the image on the homepage moves in waves without slowing down the website’s performance. Some areas of the site are slightly difficult to read since they are light blue text on a dark blue background, but all in all the website gives you the feel of maritime from top to bottom. The site also leads you through the deciding factors of choosing an attorney section by section. here’s an example of a top website to give you law firm marketing ideas. Price Waicukauski Joven & Catlin, LLCuses color well on its homepage. Any time you see color, it indicates something important or a call to action. Even the photos of the team on the homepage are black and white, while the button to play the practice overview video is mauve. Beneath the main header graphic, the team lists out its practice areas to make navigation easy to get where you need to be. Then, you have a section that covers what makes the firms different. This description is good for SEO because it provides some content to the homepage, which is generally pretty sparse on content. The homepage also features the latest news from the firm and recent court cases. Being a lawyer can mean having everything at your fingertips at all times. Because information powers your profession, the following mobile apps can help you stay in communication with your clients and provide outstanding customer service all day, every day. Lugging your laptop with you everywhere doesn't sound fun. So instead of requiring a computer to view your files, you can get the Team Viewer app for your smartphone so that you can access and operate your computer remotely. Moving your calendaring, time tracking and billing to a cloud-based application can be beneficial so that you can view it anywhere from any device. Clio integrates with Outlook, Dropbox, and Lexicata to give you a full view of your practice on the go. You may need to scan documents outside your office. Cam Scanner turns your smartphone into a scanner by allowing you to use your built-in camera to generate a PDF. This is beneficial not only for document sharing with clients, but also to manage the business side of your law firm, such as uploading receipts. Technology can help you manage your firm and engage with your clients like never before. It can make it simpler to manage your business and help you stay up to date with a variety of clients. Here are the top three office software programs to add to your practice. PRactice management software is a part of your legal marketing strategy. ﻿You can save time each month by setting up your billing in Practice Panther. More time saved means more billable hours to grow your business. The finance side of the software integrates with QuickBooks to make accounting simpler. Generating bills and invoices is as simple as clicking a button, and you can accept credit cards from your clients through the system. As an all-in-one platform, you can also track your hours that will power your invoicing and billing. Track expenses and time from anywhere on any device. It's also a customer relationship management tool with contact housing. You can message your clients securely through the platform as well. The great part is, every interaction through Practice Panther is secure, so you can work with confidence that your client confidentiality is protected. Strong software can make a huge difference in your law firm marketing strategy. Integrate your time tracking and billing into one platform where you can also accept payments so that you have end-to-end billing. The time saved allows you to focus on billable hours and client cases. The platform’s document housing is also beneficial because you can use the platform for everything you need to run a successful business. You can also provide access to your team members to view the same documents and information as you have access to. This can keep you on the same page with your paralegals and assistants so that you maximize your time. The platform is free to try and has received accolades from various industry publications. The software you choose to run your business is part of your legal marketing strategy. ﻿Bill4Time offers integration with QuickBooks, LawPay, PayPal, Strip, and Box. This way, all your tools are in one place so you can manage your practice seamlessly. Using Bill4Time, you can track time, handle your billing, offer a client portal for payment, access your tools anywhere with a mobile app and manage your documents. You can input cost per hour by client and any other nuances so that you spend less time dealing with billing and accounting.